After I pass, who will inherit my debts? - Answer from the MyAttorneyHome FAQ desk. Home › Questions › Bankruptcy › Will my daughter inherit my debts when I pass? Will my daughter inherit my debts when I pass? One common concern for parents is what happens to their debts when they die. The last thing a parent wants is to die and saddle their children with debt obligations. So what happens to your debts when you die? In general, when you die, your assets become part of what is known as your estate. If you have created a will it will identify, not only the executor, but also how you want your assets distributed after your death. The beneficiaries of your will also be designated. If you did not have a will, the probate court will determine how legally distribute your assets. What happens to your debts? Prior to the distribution of your assets and income, the courts will pay your debts. Debts which will be paid prior to distribution include credit card debt, mortgages, and any other liabilities you have outstanding at the time of your death. What happens if your debts exceed your assets? Your beneficiaries will not receive anything. If your assets exceed your debts, however, the remaining income and assets are distributed according to your will. So what happens if there are no assets or income to repay all of your unsecured creditors? Unsecured creditors will not be paid. Unsecured debts include credit cards, medical bills, and personal loans. Exceptions exist, however, if your child is a co-signor on any of the loans. For example, if you have a credit card and you die, but your child is a co-signor on that account, they will be responsible for repaying the balance of the debt. What about secured debts? If you have a secured asset such as a car or house and your heir receives that property, the secured debt is not discharged. In fact, your child will need to continue to make the mortgage or monthly payments for the asset or the lender will come and repossess the property. What if I have untouchable assets? Keep in mind, however, there are certain assets that contractually will be given to your children and will not be available to repay creditor's claims. For example, a life insurance policy is a legal contract between a life insurance company and the insured. If you die the life insurance company will pay your beneficiaries the proceeds from the life insurance policy. 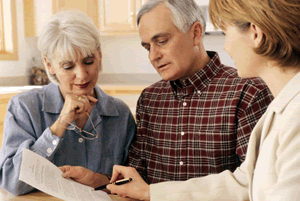 The proceeds are not consider part of your estate and will not be distributed per your will. Pension death benefits are also distributed per the beneficiary designation. Talk to your kids - It is important to talk to your kids about your financial situation. If you are going to die without assets to cover your debts your executor will need to send out letters to your creditors explaining the situation. Notify your kids they are not responsible for repaying unsecured debts, regardless of the aggressive actions of the debt collectors. The state's probate court will also have information about what bills get priority for payment. The details vary by state, but generally estate administrating fees, funeral expenses, taxes and last illness medical bills get paid first, followed by secured debts and lastly credit card debts. What's the difference between secured and unsecured debt? Will my bankruptcy record be published? Will my employer know if I file bankruptcy?